Above is the now-infamous TEDx talk given by Graham Hancock in March of 2013 entitled "The War on Consciousness," in which he shared some incredibly personal aspects of his own life and shifts in his own consciousness, and then proceeded to raise absolutely vital questions regarding the nature of human consciousness, the longstanding antagonism in western culture towards visionary states, the possibility that privileging one type of consciousness over all others might be leading to very serious imbalances with tremendously negative ramifications for all humanity and the planet itself, and the related possibility that the forbidding of some types of voluntary consciousness-altering activity among adults which do no violence to others -- while at the same time permitting and even encouraging many other types of consciousness-altering substances which do not threaten the privileged form of consciousness -- may in fact be a grave violation of human liberty and personal freedom. The talk is "now infamous" because TED decided to remove it from their official YouTube channel (thereby lessening its distribution and reducing the likelihood that people would encounter it "accidentally" while searching for thought-provoking subject matter on the TED channel), while at the same time moving it to a place where people could find it if they were already looking for it, and also at the same time publishing a note explaining that they were not engaging in "censorship" but that the talk "strays well beyond the realm of reasonable science," that he makes "statements about psychotropic drugs that seem both nonscientific and reckless," and that "it's no surprise that his work has often been characterized as pseudo-archeology" (that statement can be found here, along with statements regarding their decision to remove a talk by Rupert Sheldrake at the same time -- his talk is entitled "The Science Delusion"). TED stated that their decision to remove the two talks from their channel represents their "responsibility not to provide a platform for talks which have crossed the line into pseudo-science." Well, thank goodness for that. We can now watch the TED channel on YouTube without fear of accidentally encountering any ideas which may have crossed the line. Of course, TED has created their forum and their brand and can post who and what they want on it, and they are also free to call people names and label the honestly-expressed ideas of serious authors "pseudo-science" and "pseudo-archeology" if they want to. Their decision to move a video off of their channel is not really "censorship," in the sense that they are not using the armed might of the government to forbid the publishing, speaking, or reading of someone's work (if they were, then that would certainly be censorship and a clear violation of the rights of others). Those who disagree with TED's categorization of the work of Graham Hancock and Rupert Sheldrake as "pseudo-archeology" and "pseudo-science" are certainly free to believe that TED is egregiously wrong on this matter (which they are), and to avail themselves of the opportunity to read and explore and hear more of the ideas that Graham Hancock and Rupert Sheldrake have to offer, and to voice their opinion of TED's hypocrisy in trumpeting the motto "ideas worth spreading" and their statement that they are all about "welcoming people from every discipline and culture who seek a deeper understanding of the world" and "building a clearinghouse of free knowledge from the world's most inspired thinkers -- and a community of curious souls to engage with ideas and each other," while at the same time marginalizing two extremely thought-provoking authors who are asking questions that apparently are not allowed to be asked on TED forums and from which that "community of curious souls" must be shielded from full engagement. One is also free to point out that TED tells its visitors that it is "owned by a nonprofit, nonpartisan foundation" with a stated "agenda [. . .] to make great ideas accessible and spark conversation," and that this talk certainly raises many potential sparks worth conversing about. Again, it is important to note that TED has every right to decide to provide a platform to discuss some conversations and not others -- but their decision to marginalize and then to plaster with the condescending labels "pseudo-science" and "pseudo-archaeology" the ideas offered for consideration in these talks would seem to be extremely incongruous with the high-minded "global community" tone that TED strikes in their public persona. They say their talks cover "almost all topics -- from science to business to global issues." Graham Hancock was addressing absolutely vital "global issues" in the talk above (come to think of it, he managed to raise some important points about the topic of "business" as well). After apparently listening to the criticism that this decision elicited, TED came out with another statement, saying that by moving the videos away from the main site they invited "an open conversation" about "the line between science and pseudoscience" and "how far TED and TEDx should go in giving exposure to unorthodox ideas." This is commendable, although they then went on to say that since the ideas proposed by "Sheldrake and Hancock are so radical and far-removed from mainstream scientific thinking" they felt they needed to give potential viewers "a clear health warning" and noted that since "TED and TEDx are brands that are trusted in schools and in homes" they didn't want to have to answer to "a parent whose kid went off to South America to drink ayahuasca because TED said it was OK."
This last statement, of course, is over the top: Graham specifically stated he was referring to the right of "we as adults to make sovereign decisions about what to experience with our own consciousness while doing no harm to others" (17:40). There was nothing in there encouraging children to sneak off to South America without their parents' permission in order to drink ayahuasca (in itself a fairly ridiculous notion for most children, although perhaps the children of some in the TED audience have access to their own jets and the ability to take them out for the weekend without telling anyone where they're going). Lost in all of this -- including the invited conversation about "the line between science and pseudoscience" and "how far TED and TEDx should go" -- is the absolutely profound series of questions which Graham raised in his talk. By declaring that they were moving the conversation elsewhere, that decision and its appropriateness or lack thereof became the entire focus of the debate (as it has been in the above paragraphs, since it is a subject worth debating). But far more provocative and worth discussing are the ideas that Graham actually prepared for the talk, and into which he obviously poured a great deal of effort in order to organize and convey to his audience, and into which he even more obviously poured a great deal of his own psychic energy, and in the process offered up for public comment and consideration some aspects of his own personal investment in the subject that he is trying to get the human race to at least consider. And the fact that a great many people do not even want to consider this subject could not be more clear. That is the clarion message of TED's decision to remove it from the "mainstream" location and conversation and put it over in the "special room" reserved for distasteful issues (the "scientific" or "archaeological" merits of the talk are obviously a smoke screen -- TED hosts a great many speakers on their platform who are discussing social ideas, as well as business ideas, without taking them to task for their level of scientific knowledge; we could probably criticize a great many speakers on TED's forum for practicing "pseudo-economics," but that kind of name calling is counter-productive, and is a cheap shortcut allowing us to avoid actually engaging with their ideas). Again, TED does not have to consider any subjects they don't want to consider, or offer up for consideration any ideas they don't want to offer up for consideration: people can go find other forums on which to do so if TED shuts them out. But the paragraphs above should make it clear that the reasons they don't want to consider the ideas in the Graham Hancock talk above has nothing to do with the reasons they are publicly providing (the fear that kids will run off on their own to drink ayahuasca in the Amazon basin, for instance, or the requirement that every TED speaker on any subject must be able to pass the review of a panel of experts drawn from the disciplines of physics, chemistry, philosophy, and botany -- or even the excuse that Graham's talk was outside of the scope of TED's stated mission of "making great ideas accessible" and sparking conversations on "subjects ranging from science to business to global issues"). The reason they don't want to consider the topics Graham Hancock raises appears rather to be that he is challenging core, foundational dogmas of the prevailing religion. He is speaking what the keepers of the hidden assumptions apparently believe to be rank heresy. The decision to move the videos off of the main channel can be seen as a brilliant way of derailing the discussion of those heretical points -- not only by making them somewhat less accessible, but also and more importantly by turning the conversation in an entirely different direction than it might have taken had the videos simply stayed up among all the others as an open offering of ideas for comment and consideration and conversation, unremarked-upon by the administrators. Now, far more people will be focusing on and getting emotional over the question of whether TED has the right to brand someone else's ideas "pseudo-science" than will be focusing upon the question of whether Western civilization's antagonism towards what Graham calls "visionary states" might be leading to dangerous personal and planetary imbalances with tremendous negative repercussions. And that is a conversation that is well worth having. Because the antagonism towards the visionary state of consciousness which Graham identifies is very real, and it can be traced back to a specific period in time which marked an enormous turning point for what would become known as "Western civilization." That turning point in history took place in the years between AD 70 (the year of the destruction of the Temple of Jerusalem) and AD 394 (the end of the reign of the emperor Theodosius, when the Roman Empire was finally and decisively split into an eastern and a western half, never to be reunited, and the western half eventually formed itself into the states which now form "western Europe"). This previous post gives a rough outline of the secret campaign to take over the Roman Empire from the inside that took place between AD 70 and AD 394 -- and it also alludes to the connection that this takeover has to the suppression of the visionary, shamanic consciousness that Graham describes in his talk, and that he rightly demonstrates to be targeted by powerful forces within "Western civilization" right up to the present day. For centuries, the shamanic consciousness was persecuted because it was heretical to the doctrines of the literalist Christianity which was part of that takeover between AD 70 and AD 394. In more recent times, the shamanic consciousness has been additionally marginalized because it is heretical to the doctrines of a different religion (one that calls its opponents "pseudo-scientists" or "pseudo-archeologists," instead of "heretics"). For the record, previous posts have demonstrated that the visionary states which Graham invokes in his talk are not exclusively the province of those who interact with consciousness-altering plants: a wide variety of techniques have been used around the globe and throughout the ages to access the hidden realm, many of them involving drumming, rattling, chanting, sleep deprivation, food deprivation, rhythmic breathing, dancing, and other methods not involving the ingestion of plants (although those certainly have been used as well). Some texts and traditions actually contain some very strong warnings regarding reliance upon substances or approaches that can lead to what some traditional shamans appear to have classified as "imitation shamanic ecstasy" (this important topic is explored in this previous post). One wonders what the response would have been, had Graham urged consideration of shamanic drumming as a way of accessing visionary states of consciousness, and left off the discussion of ayahuasca or mushrooms in his argument that the war against these visionary states has potentially dangerous results. The fact that shamanic drums have been routinely and often even violently suppressed by enemies of the shamanic worldview since AD 394 is a strong piece of evidence supporting the idea that there has been a long-running war against a certain type of consciousness, and that the outlawing of ayahuasca has more to do with this war against visionary consciousness than with ayahuasca's supposed "health hazards," whatever those happen to be, if any. But ayahuasca is the method that Graham Hancock himself has used and experienced and that has, as he related, had a profound impact on his life -- and he raises the question of how one person can declare themselves to have the right to deny another adult the right to ingest a substance that does no harm to anyone else's person or property. This is a very important question, in that it goes right to the question of natural or universal law and the violation of natural or universal law (this is my interpretation of that subject: the words "natural law" do not appear in Graham's talk itself), and he connects this question to a lot of other violations of natural law he sees taking place in the world. It would seem that a very worthwhile conversation could be held surrounding the question of whether ayahuasca is in fact illegal just because someone wrote words to that effect on a "bill" which then received a seal and a signature ("He signed ya, Bill: Now you're a law! "), and whether there is a moral obligation to treat that as law until it is changed, pointing out that Lysander Spooner argued that men and women did not have the obligation to obey the Fugitive Slave Laws just because they were "signed into law" by presidents (including George Washington), and in fact that juries had the right to refuse to convict persons of violations of so-called laws that were actually illegal laws. This would seem like yet another "conversation worth having" which Graham's talk opened the door towards having, only to see TED slam that door in the world's collective face (they did at least put up a sign saying "go have a conversation about this in the broom closet, but please focus on discussing the definition of science vs. pseudo-science, and the question of what is and isn't within the scope of a TED talk"). Graham's presentation argues that only one type of consciousness has been valued by the reigning orthodoxy (a type of consciousness that he acknowledges has many good uses and many important qualities), and that another type of consciousness has been declared to be "beyond the pale" of the reigning orthodoxy. By their reaction to that talk, the decision-makers at TED have fairly well proven his argument, while at the same time declaring their allegiance to the reigning orthodoxy on this particular (and particularly important) subject. Again, that is certainly TED's right -- there are many media outlets which are busily generating content which supports and reinforces the reigning orthodoxy, and no one expects them to suddenly open themselves up as platforms where the kinds of questions that Graham's talk raises about sovereign individual rights, Amazon deforestation, the pharmaceutical industry, the wars of recent decades, and the connection of such issues to the suppression of a specific type of consciousness can be explored. It is their right to ignore these issues as well, and people can go elsewhere to find platforms willing to examine these vital questions -- and people are doing so in great numbers. Some such platforms are listed here -- along with some discussion as to why it is important to support them -- and there are many others. But these really are questions that are so important that they should absolutely be given the widest possible platform for exploration by "people of every discipline and culture who seek a deeper understanding of the world." They are questions which go right to the heart of the history of "Western culture," and the decisions and events which launched it on the path that has brought the world to this particular point. They are questions that concern every adult -- and questions which should not be hidden from children in school either. The world should be grateful to Graham Hancock for raising these questions, and for framing them in such a compelling manner, one that clearly demonstrates the importance of this question of consciousness on every level, from the individual to the global. The dust clouds TED kicked up to keep the conversation from developing should actually be seen as revealing. And they should cause us to watch the talk more closely, perhaps even writing down the questions that Graham asks, and then to start exploring those questions with others, both in person and on media platforms where such discussion is welcome. In the previous post entitled "How many ways are there to contact the hidden realm?" we saw the breadth and variety of the techniques which human beings have used around the world, across different cultures, and across the centuries to achieve a condition of ecstasy: of freeing their consciousness temporarily from the material anchor of the body and its normal senses. While many of the techniques employed do indeed make use of substances including cannabis, tobacco, mushrooms and others, it is also notable that many of them do not. While many of the consciousness-altering substances used in traditional shamanic cultures to induce ecstasy (including mushrooms, peyote, cannabis, and ayahuasca) have been outlawed over the years, it is similarly noteworthy that possession of "consciousness-altering drums" has also been widely and vigorously persecuted for centuries -- probably even more widely and for longer periods of time than have the consciousness-altering plants and mushrooms. And in Gunnloth's house was drunk. His wisdom with him home. If soon thy bed thou seekest. The above lines can be found by scrolling down to the page marked  in the online version of the Elder Edda (Poetic Edda) linked above. That online version is not the easiest to navigate, but by looking for the bracketed "page-numbers" the above verses can be found. These verses, coming as they do in the same section of the Edda in which the shamanic ordeal is mentioned, seem to establish a fairly sharp contrast between the idea of becoming intoxicated (discussed in primarily negative terms, and as a condition to be generally avoided) and traveling out of the body (the result of which, in Odin's case, is presented as positive, and the methodology of which is presented as necessary). The image of the "bird of forgetfulness" brooding over the beer, repeated a couple of lines later as a heron which traps the intoxicated with the "fetters" of its feathers (perhaps we might call these the "fettering feathers of forgetfulness") is pretty unforgettable. It's powerful imagery, coupled with delightful alliteration (Norse poetry, as also Anglo-Saxon poetry, made much use of alliteration), and causes a pang or two of regret among those of us who have met that heron a few too many times. Notably, however, there is within the warning lines (which generally present drunkenness in an entirely negative light) a reference to the mead of Gunnlod, when the speaker switches to first-person in stanza 14, indicating that it is now Odin who is speaking, and that the quest to obtain the mead of poetry (which has many aspects of a shamanic journey, especially the transformation into an eagle but also the descent into a hole in the mountain and the retrieval of hidden knowledge that could not be obtained in any other way) did involve intoxication as part of the process. This tension between the consciousness-lifting process of crossing over to the other realm, and the generally consciousness-deadening condition of becoming "drunk, dead drunk" and imprisoned by the feathers of the bird of forgetfulness (forgetfulness being pretty much the polar opposite of the usual purpose of the shamanic journey, which is to obtain knowledge rather than forget it) is found in other cultures as well -- to the point that it is worth exploring further. In Mircea Eliade's encyclopedic 1951 study of shamanic culture and practice (Shamanism: Archaic techniqes of ecstasy, also mentioned in the post cataloguing shamanic technique), some representatives of shamanic cultures seem to indicate that the need to use of mind-altering substances to induce ecstasy is seen in a somewhat negative light, at least in some cases and in some cultures. Eliade points to the existence of opinions and attitudes that: "Narcotics are only a vulgar substitute for 'pure' trance [. . .] the use of intoxicants (alcohol, tobacco, etc.) is a recent innovation and points to a decadence in shamanic technique. Narcotic intoxication is called on to provide an imitation of a state that the shaman is no longer capable of attaining otherwise" (401). This attitude (part of a pattern Eliade finds stretching across numerous shamanic cultures of a belief in the "decadence of shamans," in other words, a belief or tradition in the shamanic cultures themselves that shamanic technique and capability had decreased over time) is extremely interesting: there appears to be some recognition that, while the use of intoxicating substances may be a path to the shamanic state of ecstasy, their use can also be a crutch -- and even worse, can lead to an imitation of shamanic ecstasy and not the real thing. This tradition, from some of the shamanic cultures that Eliade and his other sources examined, would seem to be an important warning to those of us coming from "Western cultures" where knowledge of the shamanic was largely hunted down and violently suppressed for centuries. The danger posed by those offering "imitation" shamanic journeys, based more in intoxication than in the travel to the actual realm of the spirits, is one that we may want to keep in mind. It is also notable that the great Sioux leader Crazy Horse, whose own personal vision was recounted in this previous post, was known for his refusal to drink alcohol (as Stephen F. Ambrose points out on page 220 of his 1975 book about Crazy Horse, which is linked in that previous post). And it is perhaps also worthy of noting that in the Ghost Dance movement, which used dancing and drumming late into the night on multiple nights in a row in order to enable participants to achieve a state of ecstasy, alcohol was similarly discouraged. It might even be worth pointing out that in Rastafari practice, while ganja is revered, alcohol was also traditionally frowned upon. All of this is not to suggest that one method of achieving contact with the hidden realm is "good" while others are "bad," or to "privilege" one method over another -- far from it. In fact, the whole point of examining the incredibly multifarious array of methodologies utilized around the world and across the centuries was really to point out that men and women appear to be inherently designed to be able to make contact with the other realm by methods that will be available no matter what type of climate or environment or culture they happen to find themselves in. However, the fairly widespread evidence of a clear tension between paths that lead to "intoxication" or "forgetfulness," and paths that lead to what Eliade called "pure" trance (putting "pure" in quotation marks himself) suggests that we should carefully ponder the warning that these voices from traditional shamanic cultures are giving us, to be careful of shortcuts, "imitation ecstasy," and the feathers of that dreaded heron of forgetfulness. How many ways are there to contact the hidden realm? "The shamanic foundations of the world's ancient wisdom"
"Outlaw drums: evidence of the suppression of the shamanic worldview." Together, they provide evidence that cultures around the world and across the millennia, from ancient Egypt to the steppes of Mongolia, and from the far northern boundaries of Scandinavia to the southern continent of Australia, at one time shared a worldview characterized by the understanding that our familiar, material, "ordinary" reality exists in conjunction with and is interpenetrated by another reality: the seed realm, the hidden realm, the realm of the spirits, the realm of the gods. This shared shamanic worldview was characterized not only by an awareness of this other realm, but by the understanding that it was possible in this life to deliberately undertake journeys to the spirit world in order to obtain knowledge or effect change that could not be accomplished in ordinary reality. There is also abundant evidence that this worldview has been deliberately stamped out over the centuries and that practice of shamanic techniques of ecstasy (or transcending the boundaries of the static, physical, ordinary reality) has been discouraged, stigmatized, and even prohibited by law in some places right up to the present day or very recent decades, and that the tools used to cross the boundary to the other realm -- the shamanic drum in particular -- have been outlawed, seized, and deliberately destroyed. The extent of this persecution of the shamanic worldview across both geographic space and historical time leads to the possibility that those responsible for the campaign are not persecuting this worldview because they believe that it is false, but rather because they know that it is true, and that there actually is knowledge which can only be obtained and change which can only be effected through shamanic techniques. Mircea Eliade's Shamanism: Archaic techniques of ecstasy, first published in 1951, was the first text to attempt to attempt to map the outlines of the entire broad landscape of the phenomenon of shamanism, and to attempt simultaneously to situate the shamanic worldview within the history of human religion. As such, it contains many first-hand accounts describing shamanic technique from parts of the world where the old traditions were still relatively undisturbed. Let's examine the various methods recorded in Eliade's work by which men and women from traditional shamanic cultures were able to journey to the world of the spirits and to return. In Shamanism: Archaic techniques of ecstasy, Mircea Eliade catalogues many of the rituals and practices used by shamans around the world to enter altered states of consciousness, including ecstatic dance, whirling, rhythmic drumming, chanting, songs, music involving various instruments and especially flutes, fasting, the use of entheogenic substances derived from plants, the use of difficult exercises or postures similar to or including Yoga, the undertaking of deliberate spirit quests, the use of constricted and enclosed spaces, the use of very crowded spaces, the imposition of long periods of solitude, rubbing the body with rock crystals, rubbing together two stones for days or weeks on end, elaborate initiatory processes involving experienced guides, and many others, as well as many variations and combinations of the techniques listed here. The point to be made is that the techniques of inducing ecstasy in the human consciousness are profuse and multifarious -- suggesting that the human consciousness is perhaps designed to be naturally capable of achieving this state -- and that therefore the techniques that were used by the mystery cults may have included almost any combination of those listed, as well as many others. 220. Use of drums and rhythmic drumming: "The drum has a role of the first importance in shamanic ceremonies. Its symbolism is complex, its magical functions many and various. It is indispensible in conducting the shamanic seance, whether it carries the shaman to the "Center of the World," or enables him to fly through the air, or summons and 'imprisons' the spirits, or, finally, if the drumming enables the shaman to concentrate and regain contact with the spiritual world through which he is preparing to travel" (168). The importance of the drum is indisputable, and it is used to accomplish the shamanic journey in cultures around the world. Use of other musical instruments, including rattles: "In North America, as in most other regions, the shaman uses a drum or a rattle. Where the ceremonial drum is missing, it is replaced by the gong or the shell (especially in Ceylon, South Asia, China, etc.). But there is always some instrument that, in one way or another, is able to establish contact with the 'world of the spirits.' This last expression must be taken in its broadest sense, embracing not only gods, spirits, and demons, but also the souls of ancestors, the dead, and mythical animals" (179). Use of chanting: "He sways, chanting, his eyes half closed. First it is a humming in a plaintive tone, as if the shaman wanted to sing despite some inward pain. The chanting becomes louder, takes the form of a real melody, but still hummed. [. . .] The song is repeated ten, twenty, thirty times in succession, uninterruptedly, the last note being immediately followed by the first of the beginning, with no musical rest. [. . .] The shaman sings only a few measures by himself. At first he is alone, then there are a few voices, then everyone. Then he stops singing, leaving the task of attracting the damagomi to the audience. [. . .] As for the shaman, he meditates deeply. He closes his eyes, listens. Soon he feels his damagomi arriving, approaching, fluttering through the night air, in the bush, underground, everywhere, even in his own abdomen . . ." (305-306). Use of dancing: "From the earliest times, the classic method of achieving trance was dancing. As everywhere else, ecstasy made possible both the shaman's 'magical flight' and the descent of a 'spirit'"(451). "The Kirgiz baqça does not use the drum to prepare the trance, but the kobuz, which is a stringed instrument. And the trance, as among Siberian shamans, is induced by dancing to the magical melody of the kobuz. The dance, as we shall see more fully later, reproduces the shaman's ecstatic journey to the sky" (175). Use of masks or related face-coverings: "In some places the mask is believed to aid concentration. We have seen that the kerchief covering the shaman's eyes or even his whole face plays a similar role in certain instances. Sometimes, too, even if there is no mention of a mask properly speaking, an object of such nature is present -- for example, the furs and kerchiefs that, among the Goldi and the Soyot, almost cover the shaman's head" (167). Use of the tobacco plant: "The apprentice shaman of the Conibo of the Ucayali receives his medical knowledge from a spirit. To enter into relations with the spirit the shaman drinks a decoction of tobacco and smokes as much as possible in a hermetically closed hut" (83). "Throughout the instruction period fasting is almost absolute; the apprentices constantly smoke cigarettes, chew tobacco leaves, and drink tobacco juice. After the exhausting night dances, with fasting and intoxication superadded, the apprentices are ready for their ecstatic journey" (129). Use of the cannabis plant: "The kapnobatai would seem to be Getic dancers and sorcerers who used hemp smoke for their ecstatic trances" (390). "Herodotus has left us a good description of the funerary customs of the Scythians. The funeral was followed by purifications. Hemp was thrown on heated stones and all inhaled the smoke; 'the Scythians howl in joy for the vapour-bath'" (394). "One fact, at least, is certain: shamanism and ecstatic intoxication produced by hemp smoke were known to the Scythians. As we shall see, the use of hemp for ecstatic purposes is also attested among the Iranians, and it is the Iranian word for hep that is employed to designate mystical intoxication in Central and North Asia" (395). Use of mushrooms: "After fasting all day, at nightfall he takes a bath, eats three or seven mushrooms, and goes to sleep. Some hours later he suddenly wakes and, trembling all over, communicates what the spirits, through their 'messenger,' have revealed to him: the spirit to which sacrifice must be made, the man who made the hunt fail, and so on. The shaman then relapses into deep sleep and on the following day the specified sacrifices are offered" (221). "In a number of Ugrian languages the Iranian word for hemp, bangha, has come to designate both the pre-eminently shamanic mushroom Agaricus muscarius (which is used as a means of intoxication before or during the seance) and intoxication; compare, for example, the Vogul pânkh, "mushroom" (Agaricus muscarius), Mordvinian panga, pango, and Cheremis pongo, "mushroom." In northern Vogul, pânkh also means "intoxication, drunkenness." The hymns to the divinities refer to ecstasy induced by intoxication by mushrooms" (401). Note that this linguistic analysis provides yet further support for the arguments put forth in previous posts about the N-K sound, in "The name of the Ankh" and "The name of the Ankh, continued: Kundalini around the world." Use of ascetic disciplines: "The power of flight can, as we have seen, be obtained in many ways (shamanic trance, mystical ecstasy, magical techniques), but also by a severe psychological discipline, such as the Yoga of Patañjali, by vigorous ascetism, as in Buddhism, or by alchemical practices" (411). "Finally, we will briefly point out some other shamanic elements in Yoga and Indo-Tibetan tantrism. 'Mystical heat,' which is already documented in Vedic texts, holds a considerable place in Yogic-tantric techniques. This 'heat' is induced by holding the breath and especially by the 'transmutation' of sexual energy, a Yogic-tantric practice which, though quite obscure, is based on pranayama and various 'visualizations.' Some Indo-Tibetan initiatory ordeals consist precisely in testing a candidate's degree of preparation by his ability, during a winter night snowstorm, to dry a large number of soaked sheets directly on his naked body" (437). Even this dizzying list of widely varying techniques is by no means exhaustive: Eliade discusses and documents many others in his study. Further, those catalogued by Eliade are themselves by no means exhaustive: it seems that the methods for inducing ecstasy or trance are as widely varied as the human experience itself. What can we conclude from the above examination of the techniques of shamanic travel found around the world? I believe we can conclude for certain that there is no single "right" way to initiate contact with the unseen realm. While some shamanic cultures utilize psychotropic or narcotic plants, these are by no means the only methodology used. While drumming appears to be one of the most widespread techniques of initiating shamanic journeys, Eliade notes that even drumming is not universally practiced even in some deeply shamanic cultures. It appears that there are an almost infinite variety of methods which can be used to make contact with the spirit world -- almost as if someone wanted to make sure that men and women would always have some method available to them, no matter where on the planet they might find themselves! The vastness of the range of techniques by which men and women in shamanic cultures have accessed the hidden realm also suggests the probability that human beings, by their very makeup, are inherently "wired for ecstasy." We can access the world beyond the five physical senses by so many pathways that it is no exaggeration to suggest that we seem to possess a sort of "innate shamanic sense" or "sensitivity." I have never met a person who could not journey. However, I have met many people who tried journeying many times before they felt that something was happening. I suggest that you keep up the practice -- relax, keep breathing into your heart, open all of your senses beyond just your visual awareness, set an intention, and in time, you will be journeying. 42. She explains those concepts in her books -- you can find the books and other information at Sandra's website here. All people, therefore, are capable of flights of rapture. Ecstasy is a frequency within each of us. Like tuning a radio to the desired frequency, the drum attunes one to ecstasy. 14. Michael Drake's website can be found here. On one of the pages of his site (this one), he reiterates his belief that virtually every man or woman is capable of such travel: "Researchers have found that if a drum beat frequency of around four-beats-per-second is sustained for at least fifteen minutes, most people can journey successfully, even on their first attempt." The evidence from history -- and from the personal experience of longtime practitioners and teachers of shamanic journeying -- appears to be overwhelming: we are designed to be able to access the hidden realm of non-ordinary reality. This fact seems to fit well (fit perfectly) with the possibility that, as previous posts have explored, the testimony of the ancient wisdom inherited by virtually every culture on our planet, appears to declare a complementary message: that the ability to access the hidden realm is absolutely essential to human existence. Here is a link to a fascinating scholarly article published in 1995 in the Journal of Ethnopharmacology entitled "Soma siddhas and alchemical enlightenment: psychedelic mushrooms in Buddhist tradition," by Scott Hajicek-Dobberstein. The study examines some of the texts of the Tibetan Buddhist tradition, specifically the collection known as the Stories of the Eighty-Four Siddhas, written as texts in the Tibetan language in the 11th or 12 centuries AD from older oral traditions, and describing the lives of eighty-four "adepts" or seekers known as siddha. In these stories, the author believes he finds numerous allegorical references to the use of psychedelic mushrooms, including legends of eating cakes of bread balanced upon the point of a needle, visions of a beautiful woman who emerges from a birch tree, but only from the waist up (perhaps to embody the mushroom, which stands only upon one leg and which according to some analysts of sacred mushroom-lore has a symbiotic relationship with the birch tree), and references to beings or demons or deities with only a single eye (also reminiscent of the mushroom, as can be seen in the images above) -- among many others too numerous to list here. Interestingly enough, Buddhist art from Tibet sometimes depicts bodhisattvas seated in front of a large, halo-like ring which contains wavy radiating lines very suggestive of the underside view of a mushroom cap, with the radiating lines reminiscent of the gills of the mushroom. The image above (from this wiki) is characteristic of this iconography. Here is a link to a very beautiful painting from the nineteenth century with similar iconography (click on the "full resolution" link if your browser can handle it). Previous posts have mentioned authors and analysts who discuss the prominent presence of mushroom iconography in the world's sacred traditions, including this previous post which links to some articles by Paul Stamets which mention mushrooms in Buddhist art and iconography (unfortunately, some of those articles no longer seem to appear on Mr. Stamets' website), as well as to books which argue that the manna described in the Old Testament may have been meant to describe mushrooms (possibly psychoactive mushrooms). A very interesting aspect of the 1995 article by Scott Hajicek-Dobberstein linked above is his discussion, beginning in section 4.4 of his piece which can be found on page 114 of the original publication (Journal of Ethnopharmacology 48 (1995)) of the very strong apparent links between the Tibetan Buddhist tradition of Karnaripa/Aryadeva and the Norse god Odin. He points out that Odin is constantly referred to by one of his most-dinstinguishing features -- having only one eye. He notes that Odin gave away his eye in order to gain mystical powers of seeing and wisdom, which has strong parallels to events described in the lives of the Eighty-Four Siddhas. He also notes that the epithets of Odin found in the Grimnismal in the Poetic Edda include "Long Hood" and "With Broad Hat," both descriptions which could be seen as esoteric references to the mushroom. Odin often traveled about under a very broad-brimmed hat, something that readers of D'Auleires' Norse Gods & Giants (one of my very favorite books as a child) will know well. This connection between Aryadeva and Odin is in fact very profound. According to the Eddas, Odin became the supreme Norse god by a process of questing for enlightenment in which he hanged himself on the World Tree for nine days and nine nights. During this time of intense suffering, Odin gained the gift of written language through the runes, which he saw in the scattered twigs at the base of the great Tree. He imparted this secret to mankind. Note that in the ancient Greek myth tradition, Hermes was the giver of language (he corresponds to Thoth the god of scribes and writing in ancient Egypt, a connection which is borne out in many ancient sources and is practically incontestable), and thus Hermes corresponds to Odin. This ancient correspondence is borne out by the fact that in the days of the week, Odin's Day is Wednesday -- known in the Latinate languages as Mercury's Day (such as miercoles in Spanish). As Mercury is the Latin name for Hermes, this analysis supports the correspondence between Odin and Hermes (and thus the connection with Thoth). Buddha is also known as "Heri Maha," "The Great Lord"; as "Datta," "Deva Tat," and "Deva Twashta"; as "Mahi-man," "man" being probably the same as mens, mind, or intelligence, as in "Menu," or "Men Nuh." "Mahi-man" would thus mean "the great Mind," which is exactly the character given to Buddha. He is also known as "Ma Hesa" and "Har Esa," "The Great Hesa," and "Lord Hesa." 103. Note that in the mushroom article by Scott Hajicek-Dobberstein, it is Aryadeva whom the author associates with Buddha and with Odin -- the name contains "Deva," which is discussed in the 1904 text. The names "Deva Tat" and "Deva Twashta" are very linguistically similar to the names of the Egyptian Hermes, Thoth -- also pronounced "Tawt" and sometimes even "Tahuti," or "Djehuty." Nor is this the only thing connecting Buddha with the Babylonian Hea, who, as we have seen, is identified with the Egyptian Hermes or Mercury. For the "Tri-Ratna" of Buddhism, which is called "the three precious symbols of the faith," consisted of two serpents twining round a staff (see sketch), and forming a circle and a crescent, symbolic of the sun and moon, in exactly the same way as the "Caduceus" of Hermes or Mercury, the only difference in the Caduceus being that the staff is placed below the serpents. Buddha, of course, like Odin is associated with the journey towards enlightenment and inner vision. So these connections between the Buddha and Odin are not at all as alien as they may at first seem. This subject also invites contemplation upon the connection between the mushroom and the mind, the search for enlightenment, inner vision, shamanic vision, the power of language and writing, the intertwined serpents, the concept of medicine and healing, and many other vital topics. Recently, an article appeared in Fierce Biotech Research magazine entitled "Deadly mushroom defeats human pancreatic cancer in mice." The article explains that a study by a German research team found that the toxin from one of the most dangerous mushrooms known to man -- the Amanita phalloides mushroom, commonly known as the "death cap" in English -- may be extremely effective in halting the growth of pancreatic cancer tumors (so far, only in mice). The death cap is responsible for most human poisonings worldwide, and probably throughout history as well. Its poison, known as α-amanitin, turns off the protein synthesis in cell tissue. Typically, this toxin causes severe damage to the liver as that organ tries to filter it out of the bloodstream, often to the point that the irreversible damage is done before the victim even notices any serious symptoms. In the recent study, human pancreatic cancer cells were transplanted into mice. Then, the powerful toxin of the Amanita phalloides was coupled with an antibody in the hopes that the antibody would seek out the specific proteins in the tumors and shut them down, without roaming through the rest of the mouse's tissues and shutting them down as well (especially the liver). Antibodies are extremely important in biotech research, because they typically have a strong affinity for a specific protein category, and can thus be used to target specific cells. According to the article, a single injection of the powerful α-amanitin toxin (coupled with the antibody) into the subject mice halted tumor growth. After a second dose, 90% of tumors targeted by the poison-antibody combo were "erased," without any measurable damage to other (non-targeted) tissues. This is an incredible development, although it must now be seen if the results can be achieved in humans. The article does state that, prior to testing it in mice, similarly positive results were achieved in cell cultures of cancer cells in Petri dishes. This amazing research also calls to mind the research of Paul Stamets, discussed in this previous blog post. In his talks, as well as in his writings available online at his website, Mr. Stamets emphasizes the important health properties that fungi, including mushrooms, can provide, including medicinal properties (many of which we no doubt have yet to discover). Fungi and animals are more closely related to one another than either is to plants, diverging from plants more than 460 million years ago. Diseases of plants typically do not afflict humans whereas diseases of fungi do. Since humans (animals) and fungi share common microbial antagonists, such as Escherichia coli, Staphylococcus aureus, and Pseudomonas aeruginosa, humans can benefit from the natural defensive strategies of fungi that produce antibiotics to fight infection from microorganisms. Hence, it is not surprising our most significant anti-bacterial antibiotics have been derived from fungi. 2. Now, in addition to fighting microorganisms, it appears that fungi may become an essential weapon in stopping the out-of-control growth that characterizes cancer. Note that in the second of the two videos embedded in that previous blog post discussing the work of Mr. Stamets, some similar evidence of the possible effectiveness of fungi against a different form of cancer is offered. Whether you believe this is because fungi are more closely related to humans because of Darwinian evolution or not, this is amazing and hopeful. That previous post about mushrooms also linked to the work of some authors who have argued that psychadelic mushroom species may have played a crucial role in ancient ritual and mystical experience -- even arguing that the miraculous manna described in the Hebrew Scriptures may have been some sort of mushroom that appeared at dawn among the dew. Some of those authors note the fascinating fact that psychoactive mushrooms appear to have been referred to as "The Bread of God" by widespread cultures in both the Old and New Worlds. For the bread of God is he which cometh down from heaven, and giveth life unto the world. Then they said unto him, Lord, evermore give us this bread. And Jesus said unto them, I am the bread of life: he that cometh to me shall never hunger; and he that believeth on me shall never thirst. This is the bread which cometh down from heaven, that a man may eat thereof, and not die. I am the living bread which came down from heaven: if any man eat of this bread, he shall live forever: and the bread that I will give is my flesh, which I will give for the life of the world. Special thanks to former paratrooper and world-famous organic farmer Dan V. for alerting me to the report of the Amanita-antibody research. Here is a link to an amazing article published this past Monday in the March 2012 edition of Popular Archaeology and entitled "Ancient Builders Created Monumental Structures that Altered Sound and Mind, Say Researchers." The article focuses on the work of Linda Eneix at the Hypogeum Hal-Saflieni in Malta (on the island of Gozo -- see diagram in this previous post), one of the most incredible and unique ancient monumental structures on earth, where about 2,000 tons of rock were removed to create a labyrinth of curving chambers, stairways, trilithons, and columns. The site may date to as early as 4000 BC according to some estimates, while others place the Malta structures as belonging to a period from 3800 BC to 2400 BC; in any event the megalithic structures on Malta are often alleged to be among the oldest in the world. 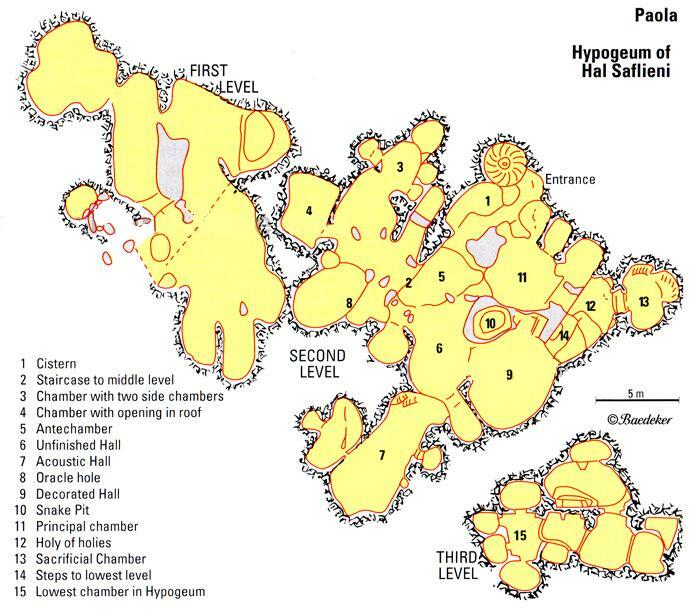 According to Linda Eneix and her fellow-researchers, the Hypogeum contains sophisticated acoustics that consistently produce vibrations in the frequency range of about 110 Hz, which apparently causes abrupt and measurable changes in brain activity that scientists at the site have documented in volunteer subjects. The same article discusses previous work suggesting similar findings at other ancient megalithic sites around the globe, including the ceremonial center at Chavín de Huántar in Peru, as well as at Newgrange in Ireland. More discussion by Linda Eneix of these acoustics can be found here, part of the Old Temples Study Foundation website. The level of sophistication in acoustic incorporation into quite challenging architectural design indicates that these extremely ancient structures were not the product of very primitive humans who were just beginning to emerge from the hunter-gatherer phase. Yet this obvious fact is quite damaging to the conventional narrative of mankind's ancient past. "Why do we listen to beautiful music about heartbreak and misery?" "Would you drink whiskey from a pilsner glass?" "What kind of music gives you chills?" It also brings to mind a quotation in this previous post, in which I wrote: "In a sense, we might say that the measurements of a building or a garden can act on us in much the same way that music can act on us: architecture is 'physical music.'" Another important implication of this nascent study of the archaeoacoustics of ancient megalithic spaces (besides the fact that these acoustic effects clearly reveal an advanced and sophisticated level of scientific and human-biological awareness) is the evidence that very similar acoustic effects appear to have been incorporated in megalithic sites on continents separated by mighty oceans, implying that the ancient civilizations that built them either had direct contact with one another or that they were descended from a common ancestor civilization (or perhaps from ancestor civilizations that had contact with one another). This second conclusion should not be very hard to believe: it should not be too farfetched to imagine that a culture demonstrating the levels of scientific sophistication required to create the acoustics of the Hypogeum of Malta might also be able to navigate by the stars and build ships that could cross the bluewater oceans. Extensive evidence of other sorts points to the fact that ancient trans-oceanic contact took place long before conventional historians say that it did. Further, the temples on Malta contain precise astronomical and solar alignments. The Hypogeum appears to contain some solstice alignments, and we have already seen in previous posts that the Mnajdra temple contains a precise equinoctial orientation. The incorporation of such alignments reinforces the suggestion that the same civilization that constructed these megalithic structures might also have had the ability to cross the oceans. Previously, this blog post discussing these alignments pointed out that the fact that the precise east-west orientation of the central corridor of this very ancient temple has been preserved for more than 5,000 years is a devastating piece of evidence that calls into question the foundations of the tectonic theory of earth's geology. Thus, the temples on Malta prove to be extremely important in preserving evidence that refutes the most basic assumptions undergirding conventional geology as well as those undergirding the conventional views about the ancient history of the human race. Finally, the suggestions about the importance of sound and vibration and the possibilities that these vibrations -- even if generated by the human voice -- have powerful and beneficial impacts on us human beings is a line of study which ties right in to the subjects discussed in this previous post, and in this previous post. The possibility that certain voice-activated vibrational frequencies can alter brain activity is fascinating; it is also fascinating to learn that some archaeologists have found traces of ergot in one of the chambers of the Hypogeum (called "The Cistern" -- see this map). The fact that ergot is a fungus with powerful mind-altering effects (LSD is in fact derived from it) points back to topics discussed in this previous post on mushrooms (also used to produce altered states by cultures on continents separated by the largest oceans). Clearly, the work being done by Linda Eneix, Miriam Kolar, and others who are researching the acoustic qualities of Hal-Saflieni, Chavín de Huántar, and other sites around the world, is beginning to shed light on a subject of incredible importance to humanity. We should all be grateful to them, and look forward to hearing more about these ancient soundwaves (and the impact they have on the mind) in the near future.